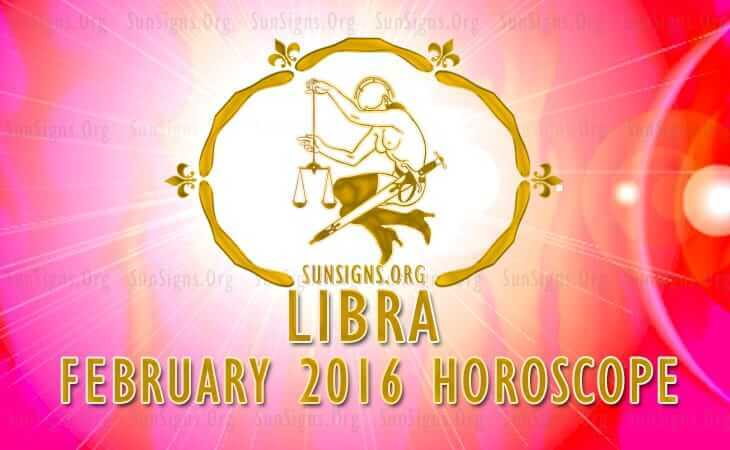 Libra February 2016 Horoscope indicates that home and family concerns dominate this month. Spirituality and inner development will also be on the radar. Planets are about to move to the upper half of your natal chart gradually and career will become important in the coming months. Planetary power is more powerful this month in the Western social half of the chart for the Libra zodiac sign. You can accomplish your goals in life with the help of others. Collaboration and conciliation are the ways to go in February 2016. Influence of planet Venus will be evident and your social charm will be evident. You will be more assured than before in your dealings. You will get many opportunities to utilize your creative talent during this period. While your talent will be recognized, you will enjoy your work. Your social confidence is very high and you are not deterred by occasional non-acceptance of your work by people. Librans seeking employment in February 2016 will be successful with the help of their friends. Business will prosper thanks to your networking with influential contacts. The 2016 February Libra predictions foretell that you will be more energetic and follow your financial goals with zeal. This will bring you more money during February 2016. As your social expertise is strong during the month, this will help you in furthering your fiscal targets. Your spouse will show keen interest in enhancing and helping your financial efforts. Till 18th February, single Librans will be swayed by passion and animal instinct while looking for love partners. After that you will look for partners with good intellectual and spiritual capabilities. You may be able to find love in people engaged in educational field. Foreigners may attract you as love mates while dating online. All Libra compatibility relationships are emotionally unsound and you may face obstacles by end of month. Permanent relationships will take time to materialize. There will be volatility in the family environment as your spouse will get entangled with relations and friends over monetary issues. Harmony can be achieved by compromise. This is not a good time for the Librans to have children. Health will be excellent during February 2016 for people born under the sign of the scales. There will be a renewed fascination for new physical fitness and nutritional programs and weight loss foods. To conclude, the 2016 Libra monthly astrology forecasts suggest that this is a month to be spent with parents and children.